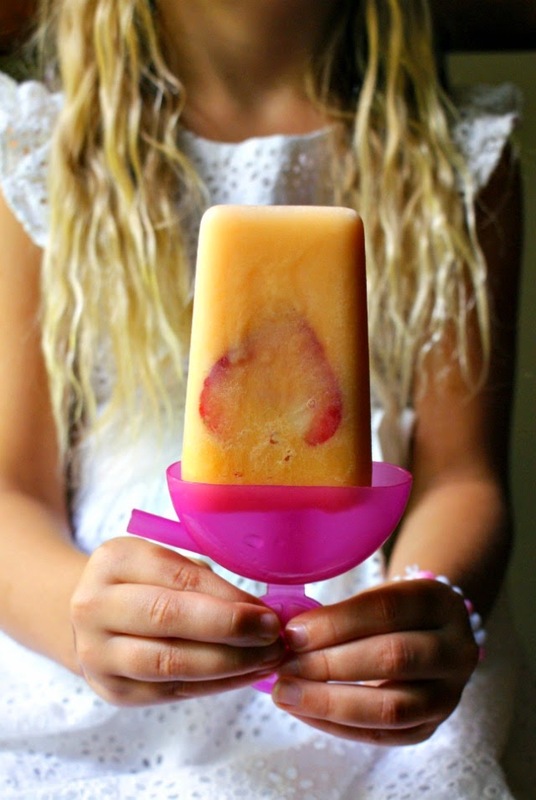 Cantaloupe Popsicles that are made with just three ingredients are the perfect way to use your fresh summer melon to make sweet and easy to prepare frozen treats. My daughter is big fan of fresh fruit. Most days she has a side of fruit with her breakfast and lunch and she always finishes every bite. Naturally, this thrills me. My son, on the other hand, frequently exercises his right of refusal, as most toddlers often do. He's a funny little bug. Picky for the sake of being picky. Like he won't eat strawberries if they're cut up, but loves them when they're whole. The same with pears. So silly. Both of my kids love when I bust out the blender to use their favorite fruits to make frozen treats like smoothies and popsicles. For my fruit-loving daughter, it transforms the fruit into an extra special treat. For my son, it's a way to get him to eat a lot of fruit he otherwise turns his nose up to. Cantaloupe is one of the fruits he won't eat when it's cut up, but he loves these popsicles! We all loved the fresh taste of the melon and the little hint of lime in these sweet treats. They're perfect for summertime when cantaloupe is in season. Your kids (and you) will love them! Put all of the ingredients in your blender and blend until smooth. Pour into popsicle molds and freeze. You can add some fresh fruit to the molds before freezing. For the popsicles pictured, I added thinly sliced strawberries. Use your leftover sweetened condensed milk in coffee, drizzled on oatmeal or pancakes, as a fresh fruit dip or freeze for up to 3 months.